Oil on Water is a story that could be read from different perspectives. The first would be how to become a journalist in Nigeria. The second a glimpse into the life of European expatriates working in the oil industry in the Niger-Delta. The last and most important in my opinion is the oil pollution in the Niger-Delta. I find it agonising to learn how oil is recklessly siphoned off by western oil companies without caring about the people that live on the land. A blighted country and atmosphere full of carbon dioxide, carbon monoxide and hydrocarbons. Polluted streams, creeks and rivers without fish. If you'd like to read more about this ecological disaster I strongly recommend A Month and a Day: A Detention Diary by Ken Saro Wiwa. follow all the rules and regulations established by the Nigerian government. When the Nigerian government are queried they blame it on the people that set the farmlands ablaze and sabotage the pipeline, it became a vicious circle where everyone is interested in making money without taking responsibility. Hence, the Niger-Delta freedom fighter was formed, they kidnap foreign (mainly white) workers and ask for a million dollar ransom from the oil company. According to them, that is how they get their own share from their land exploitation. In Oil on Water, a white woman is kidnapped and a group of journalists are sent in the jungle to make sure that she is alive before the million dollar ransom is paid. What they discovered and the real story behind her kidnapping would surprise you. Did I you I enjoy Oil on Water? let me start with saying I love Helon Habila writings, I have read all of his books my favourite being Waiting for an Angel and my least favourite "Oil on Water". Which, was exquisitely written, you can tell Helon dominates the art of writing, however, the story wasn't a strong one. At times, it read like a narrative investigation report, which makes sense because it was told through the eyes of a journalist. Maybe that was his intention? 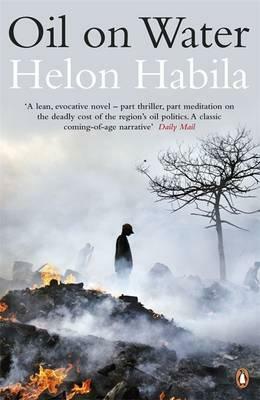 In any case, I so look forward to reading more from Helon Habila. Have you read Oil on Water?